The Poem Farm: A Poetry Birthday Party for Poet Ben! A Poetry Birthday Party for Poet Ben! Students - Today's poem is for a friend, a friend you'll meet in a moment. My new friend Ben. Cats love to visit Ben's poems, and so when I knew Ben would be visiting today for his birthday, I wanted to write a poem about this truth. 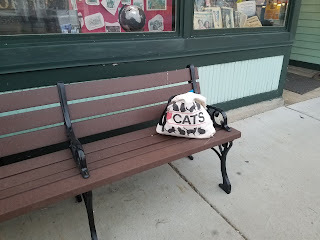 Then, last evening, as I took a walk through the village, I saw the scene you see above: an bench holding only a bag reading I HEART CATS. Perhaps cats around the world are all thinking about Ben's sixth birthday today! Sometimes when I sit to write, I write a poem for someone I care about. A thought of someone you care for is a great reason to place pen to paper. If ever you are feeling stuck...consider your loved ones. Who would appreciate a gift of words right now? Who might need such a gift? Who do you wish to surprise? Today it is my honor and delight to welcome a young poet and birthday boy to The Poem Farm. Young Ben, his mother, his school's literacy coach, and one of his teachers join us today from Crossroads Academy-Quality Hill in Kansas City, Missouri. I couldn't feel luckier! Happy birthday, Ben! Since 2013, Ben has read poems, made videos, and created artwork inspired by poets during Poetry Month. Here is a video of Ben reading William Carlos Williams for Poetry Month 2014: "The Red Wheelbarrow." And a video of him reading Pablo Neruda for Poetry Month 2015: "Ode to Hope." I am the Instructional Coach at Ben’s school, and, since January, I have had the privilege of spending most afternoons with Ben. During this time, Ben has worked on various poetry challenges and created two full books of poetry. Writing is Ben’s way to do what he loves. I introduced Ben to the poetry and lessons of Amy Ludwig VanDerwater, and he soon became a huge fan of The Poem Farm and Amy’s work. Ben has great interest and talent with poetry. He loves words and his skills far surpass an average 5 year old. To try and meet Ben where he is, give him what he needs, and feed his creative spirit, we came up with the idea of partnering him with Emily Callahan (a fellow lover of poetry) during our school wide intervention time to work on deepening his understanding and love of poetry. Today, May 12, is my 6th birthday! I am a founding 1st grader at Crossroads Academy-Quality Hill. Our school opened in August, 2016. It is located in the heart of Downtown Kansas City, Missouri. I am lucky to have wonderful teachers here and the chance to write and read poems almost every day. I am a big fan of poetry! Here's a video of me showing this! I like writing poems about cats. I like cats. Poems can follow any rules. You do not have to write poems with the same rules that I did. I like writing poems because they can be about anything. I was 5 years old when I started publishing my poetry books. This year, I discovered Amy’s 2012 National Poetry Month Dictionary Hike Challenge, and I was inspired to do my own! I have published two books: Alphabet Challenge for Poems: Poems A-Z and Color Poems (based on Amy’s Poetry Month challenge this year). You can hear me read these books and watch the book movies! On May 3, I got to Skype with Amy! My parents got to come too! But also like a wild animal. Thank you to Amy, Mrs. Callahan, Mrs. Lupton, Mrs. Weseloh, Mrs. Reasby and Ms. Williams for helping and encouraging me. To celebrate Ben's writing, today I am offering a giveaway of Kwame Alexander's new book, OUT OF WONDER: POEMS CELEBRATING POETS. Please comment to be entered into this giveaway, and I will draw a name next Thursday and announce the winner next Friday! To continue enjoying poetry all week long, visit Tara at A Teaching Life where you will find this week's Poetry Friday roundup. All are always welcome! I AM SO LUCKY to get to spend afternoons with Ben! Such a brilliant mind who has taught me so much:). Happy Birthday Ben!!! Ben, I LOVE your poems! Keep writing. I can hardly wait to read your amazing poems! Happy Birthday! Ben is an amazing human. He has a creative and analytical way of looking at the world around him. These are wonderful qualities in a poet! I love working with Ben and watching his process unfold. Happy Birthday, Ben! Amy, the thought of a cat visiting poems is a lovely birthday gift for Ben. Wow, already writing a third book is quite an achievement. It's wonderful to read all the words working poetically in your poems, Ben. I like those new emotion poems, think other children will like knowing about sharing feelings in poetry, too. Thanks for sharing so much. And Amy, thanks for your lovely post. Happy birthday, Ben! You are quite a poet. Thank you for sharing your poems and your thoughts with Amy and the rest of us, too. I hope you enjoyed the cat poem she wrote for you. I sure did! What a fun post, from Amy's cat poem to all of Ben's! What a talented writer -- enjoyed all the videos and quotes. Thank you and Happy Birthday, Ben!! Thank you for introducing us to Ben. Ben, I am a fan of your work and you inspire me to go write this morning. Your writing is profoundly truthful and brave. I applaud you and am so glad that I have had a chance to peek at your work so early in your career. Way to go, man! Keep writing. It's the best! Happy birthday, Poet Ben. From Suggestion for cats to Ben's poetry, this post was a delightful stop this morning. What a treat to meet Ben today. (Happy birthday!) I also loved your cat poem, Amy. I think I could "snuggle-snooze" between the words, pictures, and videos of this post all morning long! Ben, I feel like I know you, just by reading your poems. I too learned to cherish poetry and even write some last year when I was an interpreter in Mrs. Callahan's classroom. I watched her engage an entire class of 4th graders into persuing a love for poetry. Every day was magic in her classroom. Continue to write and love poetry. There are no boundaries with poetry...I learned that from Mrs. Callahan. I think Ben is the youngest poet I've met. I think my students are poets, but they are all older than Ben. He's quite amazing. Happy Birthday, Ben! And here's to more and more poems from you! Ben, you are amazing! Your Quality Hill Family are so happy you joined us this year. I am proud of you! Ben, I am so lucky to have you as one of my artists. You bring immense joy and inspiration to our art room! I am so proud of your accomplishments as a poet and watching you write poems is a magical experience! I cant wait to read more of your work! Lovely cat poem Amy! Happy Birthday Ben, I'm glad Amy shared her post with you, what wonderful poems you are creating, thank you both! Ben, it is an everyday honor to be involved in your learning journey. I am ever in awe of how you explore, interpret, and enhance existence. Beaming with joy that you are sharing your wonder with the world!! It has been an honor and privilege to teach you this year. You have been my teacher too because I learn from you all the time! You are an amazing author and poet. I will be the first in line to buy your first book! This is awesome Ben, I am so proud of you! Keep writing!!!! - Señorita V.
this blog post made me "all kinds of happy!" go ben! go poetry. this is what it's all about. so proud of all of you poetry passers!